Spider Mite Predators Are Natural, Non-Toxic, Environmentally Friendly Solution to Spider Mite Infestation Problems! Spider Mites are a common garden and greenhouse pest attacking over 180 different ornamental plants and agricultural crops outdoors, in fruit orchards and greenhouses and are especially damaging to cannabis plants. While spider mites can be a problem for most gardeners, a cannabis grower can have hundreds of dollars in damage in a matter of weeks. Under optimum conditions (approximately 80 degrees F) the time from egg to an egg laying adult is between 5 to 20 days with many overlapping generations. The adult female lives 2 to 4 weeks and is capable of laying several hundred eggs during this time. Sprays have no effect on the eggs and adults can develop a tolerance after extended use. Spider mites are about the size of the period at the end of this sentence and the damage they cause is more noticeable than the spider mites themselves. 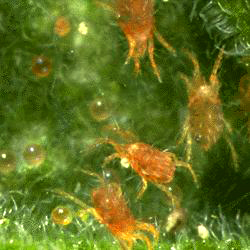 The spider mite feeds by piercing a single plant cell at a time and sucking the sap. This will eventually leave a tiny brown or white sunken spot and may cause distorted leaf growth. This causes photosynthesis to decline and can hurt agricultural crop production. Some species produce fine webbing around the leaves they’re feeding on and near the tops of the plants where humidity is lower. When temperatures are high and humidity is low spider mites will feed more, causing increased damage. This also causes female mites to lay more eggs in a shorter period of time. Hot greenhouses and interiors with potted plants present favorable environments for spider mites. Field crops also experience spider mite problems such as strawberry and mint fields, grape vineyards, and apple, almond and avocado orchards. Spider Mite Predators Work to Save Your Crop! Spider mite predators will consume about 5 to 10 adult spider mites or up to 20 eggs daily and will reproduce faster. Getting an early start is a key aspect in spider mite eradication. It is easier to stop a small problem than a big one. Using sticky yellow cards will help alert the grower that a spider mite problem is beginning so they can get a jump on control. Monitor infested plants with a hand magnifying glass and re-apply within 14 to 21 days if infestation is still present. Washing infested plants and using insecticidal soap while waiting for your Spider Mite Predators to arrive is very helpful. Simply misting plants is also beneficial, as spider mites prefer low humidity. Check below for the species that best help your situation. Order form is below product details. IMPORTANT! Orders need to be placed by Friday for shipping the following Tuesday and need to be shipped Overnight UPS or FedEx. Temperature range is 70 to 85 degrees and 60 to 90% humidity. The persimilis is our biggest seller for cannabis growers and is the ideal beneficial for 90% of the cannabis growers we talk with. 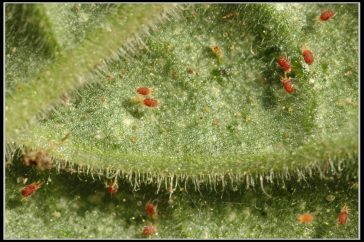 They attack 2 spot spider mites, Tetranychus urticae and mites in the Tetranychidae family. Because of its high reproduction rate, persimilis usually exhausts its food supply and eventually dies out. Since they only feed on mites they are not intended as preventative measures. Temperature range is 55 to 85 degrees and 50% humidity or more. Also attacks Broad Mites and Hemp Russet Mites. They can survive for a few weeks on pollen alone making them an excellent preventative measure. Works well in conjunction with persimilis. Release 2-3 per sq ft. Temperature 70 -86 Humidity 60% +. Works best when used as a preventative measure as they also feed on pollen and other small insects. Tolerates higher temperatures and lower humidity than persimilis. Also very effective against Broad Mites. Release 5-15 per 10 sq ft.
Tolerates higher temperatures 80 -110 degrees and lower humidity, 30 to 40% than persimilis. Does well in areas with low humidity and can tolerate temperatures up to 90°F. A tiny black beetle best when used with other predators (fallacis & persimilis). Feeds on spider mites in both larvae and adult stages, adult females can consume up to 40 spider mites per day. These beetles smell spider mites and will move on to new infestations. Adults fly from plant to plant. Remember – All Spider Mite Predators Must be Shipped Overnight!